This French Onion Pork Chops recipe is the first in my attempt to create new dinner dishes that can be made quickly but yet still have that richness and depth of flavors of a dish that has been cooking all day. I want all the sides to also be able to be made in 30 minutes or less. Plan what you are going to make ahead, write them down and purchase the ingredients. Have all your ingredients and pans set up on the counter and stove for cooking. Have the oil getting hot, the water boiling and the oven on. Have your plates and garnish ready for plating. I’m in the interview/audition stage for a tv show about fast cooking . It’s so exciting to be thought of for this show! I can’t tell you what the show is yet but I will if and when I get on it. I looked through all my Pinterest recipes for ideas for things I could make in 30 minutes and I came up with this one with inspiration from Kudos Kitchen ‘s recipe. 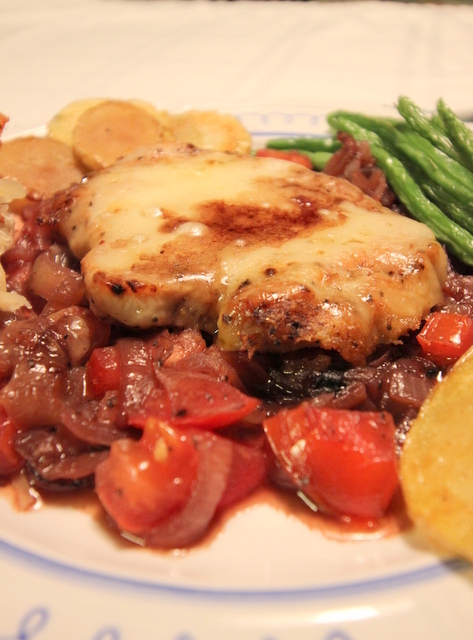 For this French Onion Pork Chops recipe, I purchased all the ingredients the day before. Just before you start cooking get all the ingredients out of the refrigerator and cabinets. Place the onions, beef broth, spices and wine together. Salt and pepper and spice your pork chops and set aside. Get the oil boiling. Open the boxes and use cooking shears to open any packages that are hard to open. The first thing to do when making French Onion Pork Chops is slice your onions. Slice the onions in circles and then slice again to make semi circles and get them cooking. Place a tablespoon of oil in a skillet and place in your onions, add salt, pepper and flour. After the onion mixture is combined, add the beef broth and red wine. Continue cooking until the liquid is reduced down but not more than 15 minutes. Add the tomatoes in the last 3 minutes of cooking. While you are making the french onion sauce, slice the potatoes, bread and get your green beans ready. These can be fried as soon as the oil in the other pot is hot. Fry the bread, then the potatoes and then the beans. At the 15 minute mark, heat the oil in a skillet and when hot add the seasoned pork chops to the skillet. Cook and brown the pork on both sides. Don’t forget the salt, pepper, onion powder and garlic powder. Add a little beef broth and wine to the pork during the last 5 minutes of cooking. Pork Chops on a french onion sauce is delicious and can be made in 30 minutes or less. Sprinkle the swiss cheese over the pork chop. Divide the french onion sauce in the middle of each plate. Place a pork chop in the center of the french onion sauce. Surround with bread stick, potatoes, and beans. Sprinkle the dish with additional cheese as you feel appropriate. 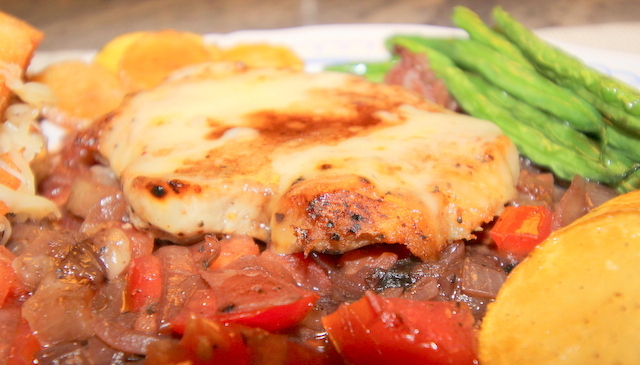 Enjoy a delicious, rich and filling dish with this French Onion Pork Chops! 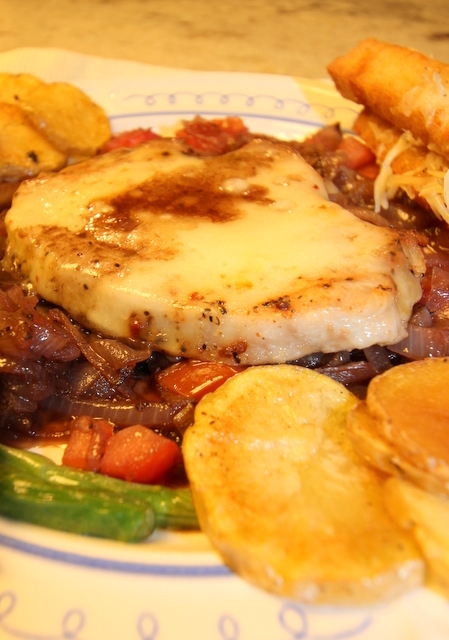 Pork Chops on top of a french onion sauce is delicious and can be made in 30 minutes or less. 4 slices Swiss cheese, plus additional cheese for bread sticks if desired. Slice the onions in circles and then slice again to make semi circles and get them cooking. Place the butter in a skillet and add sliced onions, add salt, pepper and thyme sprigs. Saute for 5 minutes. Cook onion mixture for an additional 5 minutes, until carmelized. add the beef broth and red wine. Continue cooking until the liquid is reduced down but not more than 10 minutes. Add the tomatoes in the last 3 minutes of cooking. Preheat the cooking oil in a pan. While you are making the french onion sauce, slice the potatoes, bread and get your green beans ready. As soon as the oil is hot reduce heat to medium. Fry the bread, then the potatoes and then the green beans. At the 15 minute mark, heat the cooking oil in a skillet and when hot add the seasoned pork chops. Cook and brown the pork on both sides. Add the salt, pepper, onion powder and garlic powder. Add a little beef broth and wine to the pork during the last 5 minutes of cooking. Sprinkle the swiss cheese over the pork chop. Divide the french onion sauce in the middle of 4 plates. Place a pork chop in the center of the french onion sauce. Surround with bread stick, potatoes, and beans. Sprinkle the dish with additional cheese as you feel appropriate. Enjoy a delicious, rich and filling dish! I love the concept of 30-minute meals and this one looks great. I know it will take me longer than 30 minutes (because I am a slow poke) but at least I won't be spending hours at the stove. Great weeknight dinner! Me too Kylee. I think everyone needs to have 30 minute meals recipes. I cook those most often! 30 Mins Meals are such a savior, love the recipe and its really simple to make. Thanks Molly for your comment. It was really easy to make and we thought it was yummy! Definitely #3 is important and organizing everything ahead of time. Hope you do try it! Such a delicious smothered idea! I'm pretty slow in the kitchen, so I'm betting a dish like this would take me longer, but one you get in the groove with it, it does sound speedy. Definitely Alisa. I was trying to make a deadline so was purposefully trying to make the dish in 30 minutes. Realistically if you take your time then it could take a little longer. Plus the size of your pork chops could determine how long they need to cook! These weren't thick. Oh my goodness, these pork chops look amazing! I am loving the French onion sauce! Thanks Marye! The French Onion Sauce was pretty tasty! That is such exciting news!! This recipe is definitely quick and delicious looking! Thanks Kacey. It's a winner! I'm excited about the audition. I'll let everyone know if I get it so everyone can watch. :) Thanks! SO awesome about the new opportunity! I hope it works out :D I know I'll be trying these pork chops for sure - I need more quick dinners like this in my rotation! Thanks Chrisy, Hope you like the pork chops! I am with you on the quick cooking!! It's got to be quick over here or it gets dangerous. ;-) Good luck with your audition! That's so true if you put onions and cheese on anything and it's good. Thanks. Quick and easy - in and out of the kitchen - I love it! The pork chops look delicious! It is one of those quick dishes that is very tasty! Thanks Tina. My mom used to make something like this when I was a kid. It's so deliciously comforting, and the fact you can throw it together in 30 minutes is such a great bonus! Thanks Renee. It is a quick and tasty meal! These sound wonderful. You can never have too many 30-minute meals up your sleeve! 30 min meals are the best! This looks wonderful. I love when recipes are quick AND full of flavor! This is going on the to do list! Thanks Dorothy. Let me know if you try it.